The ever-changing scenery of the Great Sandhills in the prairie lands of Saskatchewan. The Sandhills which are subjected to the strong northwest winds, are said to be moving at a rate of 4 metres eastwards each year. 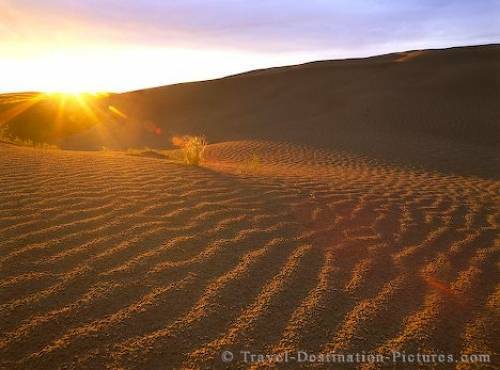 The sunset is a great time to photograph the Great Sandhills of Saskatchewan as the golden light turns the dunes red and highlights the ripples on their surface. Picture of the late afternoon sun lighting up the Great Sandhills of Saskatchewan, Canada.